Thank you guys, after that post I have come to the realisation that I think a complete redesign of the track would be better, almost a starting from scratch. The basic shape is fine I think I need to move thing round and see what I can do. The basic design was from Simon's Shed and I modified it, I feel its a great design I just want more of my own touches on it, I have limited myself with putting the station in a specific place because that's the design I modified. As others have said this happens. I relaid and adjusted my track design five or six times before it felt right and ran reasonably well. I am sure you will find you have learnt a lot from the first attempt and will achieve better results. 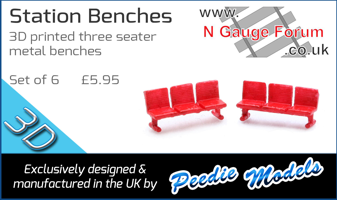 Importantly you will have a layout you are happy with which is vital for enjoying the hobby long term. Looking forward to seeing your progress. Keep going and enjoy. Well I did it, After a week of being disheartened by my layout and needing to rip up some track and the hillside I had built, I cracked on with it today. I will need more flexi and a couple of extra points to change the design to the way I need it to be. When it comes to doing the hillside again I will be doing it lower as that one was just a bit too high. 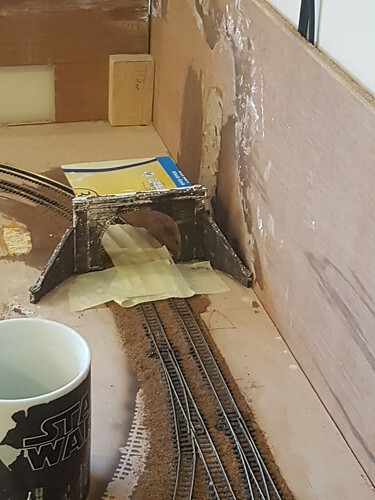 I will ballast BEFORE I build the hillside this time round, I wont use short lengths of track and my points will not start right on the end of a curve. All things I have learnt from making this layout. The wiring is now being done simpler than before, as I am sticking with DC and not intending on going down DCC at all becuase I do not think I can afford the control system and then all the decoders. 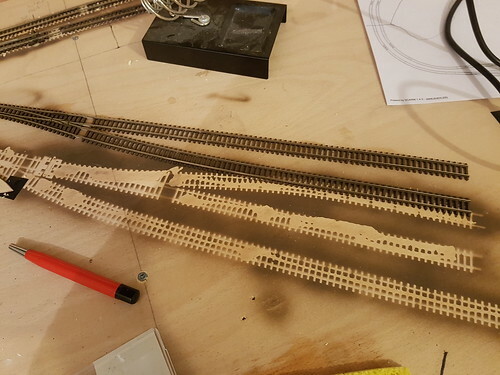 That is all guys for now, It might be a few weeks before I can get cracking with the next set of track laying as I need to buy the flexi because I only have 1 length left. Update time at Oakford Hills. It has been a while due to work commitments and life in general, plus waiting for track deliveries to arrive. All track is now back down and insulated joiners where required have been fitted. It has all been Dapol 9F tested, so if that runs on it most things will. 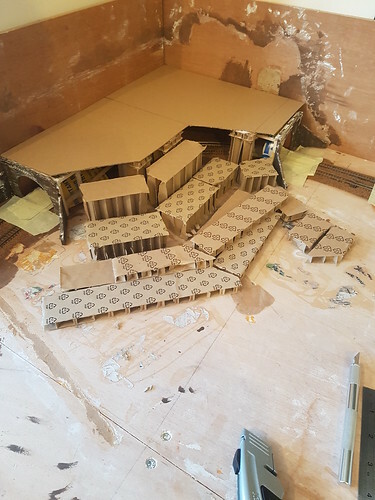 The next step is to put in the double engine shed roads, which will have multiple isolating sections so i can accommodate more than one engine in the shed area at one time, the length of track leading to the engine shed is actually long enough to hold multiple 0-6-0 locos or a 2 car DMU with ease, the shed is big enough for the 9F to sit in comfortably. 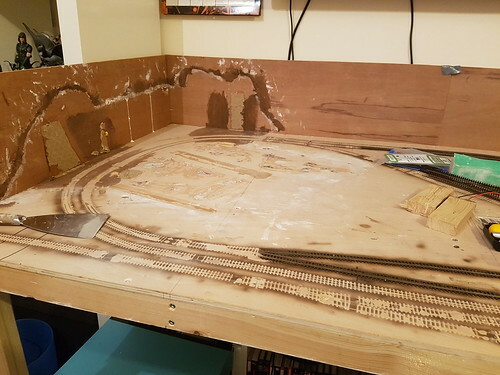 I have also got to lay the internal sidings too, they may end up being changed from the original 3 sidings down to two, as I may have changed my plans for the abandoned one, keep watching to see what I decide to do. I will be posting in the 'show your new locos' post the photos but I am having to invoke rule 1 on my layout for my latest two locos, Graham farish Class 66 and Dapol 4472 flying scotsman, my second scotsman, I have an older poole era farish one too. I've just completed reading this thread and look forward to future posts. I'm even more interested after your last post. I've limited myself to DC so your accomplishments will be even more relevant to me. I enjoy reading (and watching video) about DCC layouts, but a lot of the posts are too technical for my complete understanding. I'm impressed by how quickly you work. I'm rather slow and methodical - to my detriment. I'm just eight months into my project - from concept to design to track laying and completion of basic landforms. I'm actually further along than I expected to be when I started. I planned on a two-year project before realizing I'll never finish it! Two things I've realized are 1) there will still be problems when the project is complete, and 2) many of those problems are related to mixing rolling stock from different manufacturers. I've elected to us only Kato track and points, but some locomotives and/or coaches and wagons don't like the track geometry (that after I've altered many curves and removed a few tight points. As someone else has said, all of this is part of the interest in the hobby. I don't expect to see trains running without some problems or scenic design satisfying my expectations - but I'll keep trying! Your photos and video are really helpful and greatly appreciated, so keep them coming! A busy day today, I have made full use of my day off work. This morning I laid and glued the internal sidings, I have had to change the number of sidings and their position. 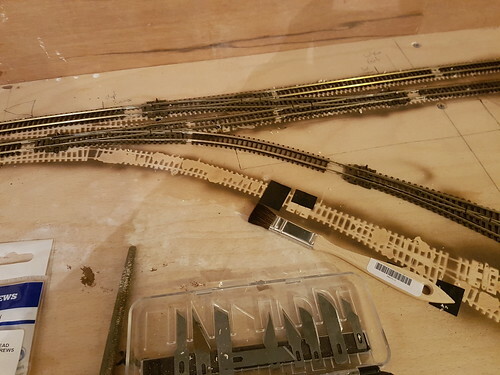 When I did the change of the position of the points after the curves of each loop I ended up having to shorten the sidings, this also in turn changed the position of the second point on the sidings and it would have fallen on the baseboard support so I decided to drop one siding and have just a 2 road. You can see from the old outline from track weathering how much distance the sidings have moved and that there used to be three. 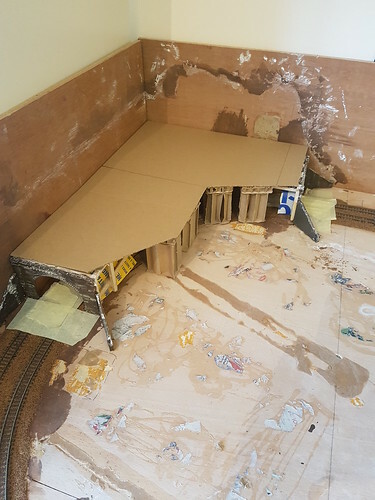 The rest of the day was spent aligning up the track for the two road engine shed at the front of the layout, this was a troublesome exercise but I have managed to get it done, so glad I over ordered on the last order of flexi as my off cuts I had left from the rest of the layout tended to be a few mm short. The main challenge for the day was correctly soldering droppers to the underside of the track, getting it wrong and having to gouge out a small gully in the baseboard to accommodate the feeder wires. As I have decided to stay DC for the foreseeable I have opted for isolated sections on all of the sidings, I have done this so I can store locos on the layout and not have them going for a merry little jaunt out of the sidings whilst I am running stock. The engine shed has 2 isolated sections per road, one runs from the point all the way to just outside of the engine shed and the other is inside the shed itself, this allows for a little bit of play and I can store 2 or 3 locos whilst one runs, on the inner track I can store 1 and run another desperately. To control the isolated sections of track I have ordered myself 3 on-off-on switches, this way I can control power to one or the other off the same switch without having one constantly under power, so I can completely shut down the power or power either one, it also means less switches. 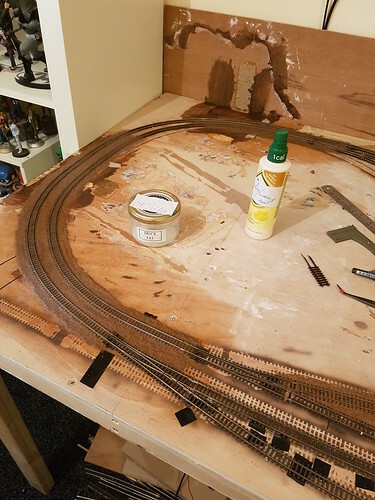 That is actually all the track laid down now, the next major job is ballasting, oh joys. I can store 2 or 3 locos whilst one runs, on the inner track I can store 1 and run another desperately. Your not wrong, separately would be better but they may well end up running desperately too. Ballasting has begun at Oakford Hills. I am using fine brown Javis ballast (I think) I swap ballast over into a clip lock type pot for safer storage so I dont have the bag anymore. 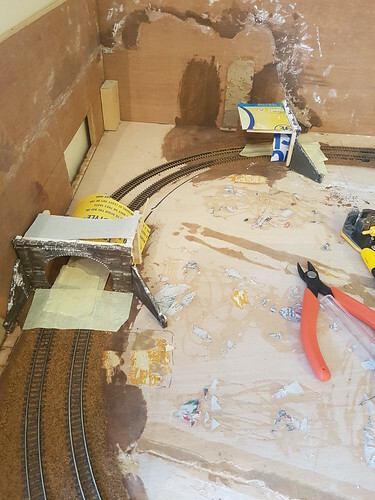 This is the second section to get the ballast treatment, the first was a siding which was done yesterday, I advanced onto the main running lines today. From the photo you can see a small gap in the ballast, this will be under a hillside, I have done some ballasting under the hill so it can be seen when looking into the tunnel portals. In the photo you can also see my two aids to ballasting. Thanks to christmas we have an empty duck fat jar, I have washed this out and cleaned it and now use it for pva/water mix for ballasting, the next item is the fry light spray bottle, whilst it is fairly powerful it can be used to good effect by not spraying directly onto the ballast, if sprayed over the track paralell with it then the mist lands on the ballast without moving it at all and then the ballast is wet and the pva/water mix can be applied. For applying the pva/water I used a pipette, I have a very large bag of over 100 of them for naff all thanks to fleabay and cheapo chinese imports. 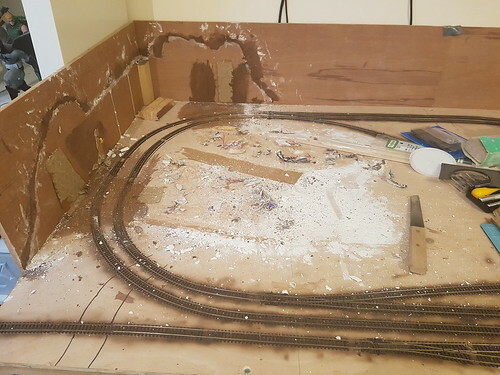 I will slowly work my way round the rest of the layout and carefully work on the points. Once all ballasting is done I can finally get back onto scenic land areas. It's been a while since my last update, earlier this month. Well a pretty big thing happened, I have actually gone down to what some consider the dark side, DCC. Managed to get my hands on a white z21 for £80, I have chipped 3 locos, 4mt standard tank engine, class 66, and class 58, I will be chipping my black 5 at the weekend and then slowly doing the rest of the locos, class 108 dmu (so two decoders yay), flying scotsman, then the challenges start, a class 08, 04, and pannier tank, those will need smaller decoders but not impossible. I had a few teething problems with the z21 but they were sorted out thanks to a fantastic bit of help on a facebook group dedicated to the z21 and dr5000. All point motors are fitted, working, and wired up to the CDU, at the moment I am having to keep my gaugemaster combi plugged in for the accessory power output but eventually that will be replaced with something more appropriate for the powering of the points, or I may very slowly DCC my points. I have to fault find on one point, which is part of a passing loop, for some reason it appears to have stopped throwing, I may have knocked one of the terminals but then the other end of the loop would not still throw, as I said a little bit of fault finding in the light of day and not after 6 hours of messing with my z21. 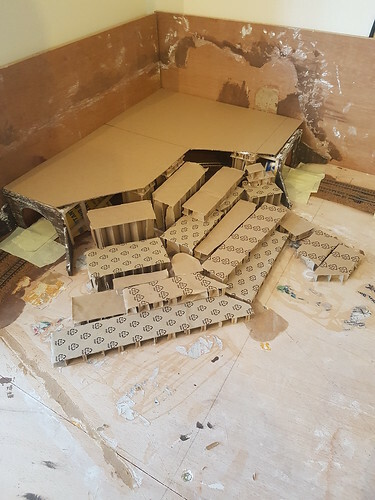 Scenic work will be commencing in the coming days, I'm beginning with hillsides, yes that's right, two of them, one will not just be a hill with no road or anything the other will still be a corner of a town and the station building. I'll keep you guys updated as I go along. I hope you'll be really pleased with DCC. Not only does it make operating the trains more fun, but you can group points together to make routes, which means a single route can move a train right across your layout. It might be worth considering converting your point motors to Cobalts which can change the frog polarity reliably and, also, both points in a crossover can be given the same DCC address so they change as a air. Pain in the backside to setup the z21 as previous owner changed the IP address so I couldn't get it to work for hours. The cobalt would be great, at the moment maybe too expensive for me that's all. A full productive day over at the railway. I hard wired in a decoder to my black 5, I'm really made up with that as I did it without any assistance or asking for help. I also noticed within one set of points I had missed ballast out so I have done a tiny bit of ballasting today too. I started scenery on one side of the layout, particularly the land form. I re-installed the tunnel portals, added an extra bit of ballast inside the tunnels where I had missed before the portals where in place. 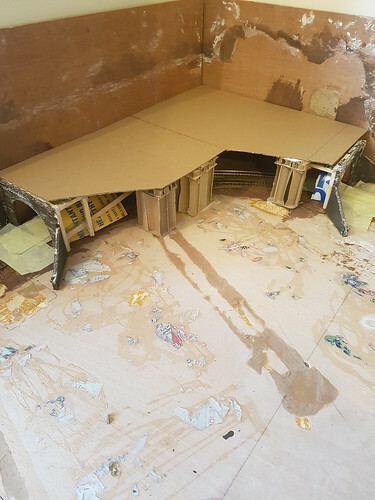 I used a thin but strong piece of card, from packing of many bathroom items we have had delivered, to form the main base for the hillside, with enough clearance to be above the tunnel portals and so it sits on the corner support made from wood. This is the dry fit photo, just to see where the front supports would go, in the next I have moved one support to the rear to allow for more overall support rather than just at the front. I have also glued them in place, just using cheap PVA. The dry fit of what will become rolling hillside, in the next photo I have glued and added more to the lower section to plug a few gaps. The finished article, I have added thick card to the top to make what will become a nice rolling hill which will be covered in some trees, maybe even a sheep or two. 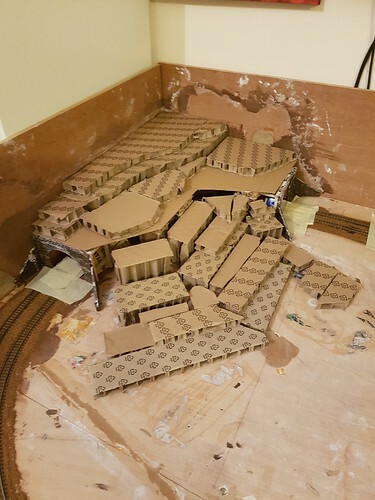 On the previous iteration of this hillside, see earlier posts, I used plaster bandage to make the overall hill shape, this time I am trying something else which people have recommended, and I have read it in Model Rail too, using kitchen roll soaked in dilute PVA. I will be trying this tonight.